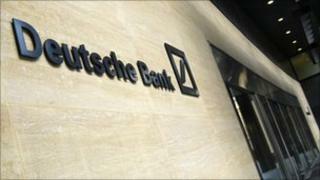 Deutsche Bank will pay $554m (£360m) after admitting criminal wrongdoing in helping rich people shelter from US taxes. The sum includes the amount of taxes and interest that the Internal Revenue Service (IRS) was unable to collect. Federal prosecutors and the Justice Department said a non-prosecution agreement required the bank to continue co-operating. It must also allow an outside expert to make sure it does not do it again. Deutsche's tax evasion took place between 1996 to 2002. Its payment to US authorities follows a settlement prosecutors reached with the Swiss bank, UBS, which paid $780m in fines for helping clients hide their accounts from the IRS. Deutsche's $554m payment also includes a civil penalty of more than $149m. The bank said it was pleased the investigation had been resolved. A statement said: "Since 2002, the bank has significantly strengthened its policies and procedures as part of an ongoing effort to ensure strict adherence to the law and the highest standards of ethical conduct." It added that it had already set aside the money and the settlement would, therefore, not have any impact on current net income. Recent figures from Deutsche Bank showed it made a third-quarter loss, which was linked to its planned purchase of Deutsche Postbank. It reported a pre-tax loss of 1.2bn euros ($1.66bn; £1.05bn) in the quarter, hit by a 2.3bn-euro charge connected to the Postbank deal. Excluding the Postbank costs, net profit for the quarter was 1.1bn euros.